A physician who enters into the DPC model can find a lot of “admin” work falling into their lap, especially in the beginning when she/he might find that time could be better utilized in building a DPC practice and establishing great care with their patient-members. Once the insurance companies are removed from a DPC office, the internal work-flows change (in a great way because the practice is now YOURS) and sometimes it can take time to establish internal systems. 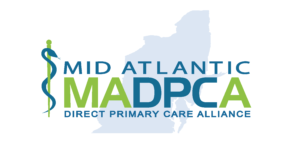 But once a practice is up and running, well-structured systems only add to this wonderful medical model called Direct Primary Care! Also please note that the documents in this manual provide links to augment the content of the docs themselves that can help answer additional questions and provide more information to supplement what is here. CDC: Why spend time searching VIS’s, protocol for storage and monitoring of vaccines while in the refrigerator? Which thermometer should I use, how to I track temps for safe vaccine storage? It’s all here. CLIA: What is a waived test? You could spend hours on the phone with your state agency and then have to write a policy…. Employee: What is the difference between a contract and agreement when hiring? Employee Agreements do not require annual renewal like a contract; a template for that is provided here. Contracts do, and they cost $$ to get. The Employee Manual provides a framework so you don’t run into issues with employees in the future. And the doc is customizable and editable to your office’s needs. HIPAA: Well, where do I start? Unfortunately, we do have to pay attention to HIPAA. Dennis Hursh, a healthcare attorney, modified some of the policies to apply to cloud-based EHR which most DPC offices are using. This takes some of the burden off the DPC office in some areas, but we do need to self-audit. All you need is a patient hearing you talk on the phone about another patient (because so many of our offices are on the smaller size in square feet), or walk by a counter top and see a fax with their neighbor’s name on it and you may have a complaint that triggers an audit. Simple stuff, simple fixes can help avoid a complaint and an audit. OSHA: Again, where do I start? This is also a necessary area of compliance. OSHA training can be obtained through other services but the other means of doing OSHA training quite often do not include the necessary forms required to make a binder of policies and procedures, or report an incident. Those needs are covered here. OHSA seems to be one of the TOP entities to show up for an audit. Templates provides examples for different aspects of patient communication. Some of these have already been shared on DPC Facebook groups so this chapter is included free with any chapter purchase and is priced appropriately so as not to break anyone’s bank! Advertising is a compilation of various content for social media, town halls, patient information, and other informational material. A good portion of the advertising content was created in conjunction with a marketing/social media consultant. Using content from either of these chapters can save hours of valuable time and may spark some new ideas to make it easier to develop new template and advertising ideas. 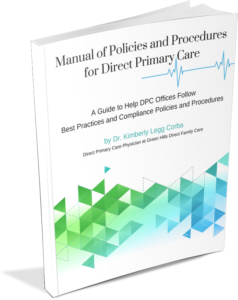 Contains Everything You'll Need to Transition to a DPC Practice.